Last month's installment of Growth Path Accounting presented the Step One question, "Where are you now?" in regard to accounting method (cash or accrual) and accounting oversight (family or professional). This month we'll continue with the "GPA Decision Tree," with the Step Two question, "What are your information goals?" Producers who chose the strictly cash accounting method now decide if they want to incorporate real-time inventories into their accounting system. By "real-time" we mean that crop, livestock, feed, seed, chemicals and fertilizer quantities on hand are updated through accounting entries. If real-time inventory control is not a priority then by default you have selected Method C, the most basic system. On the other hand, cash accounting producers who wish to track inventories will choose Method B, a "hybrid" system. 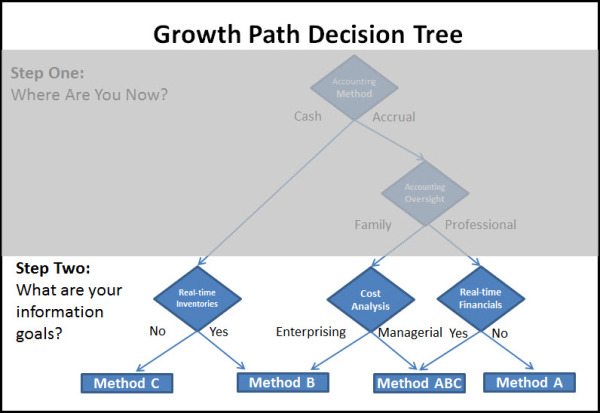 Moving to the right in the decision tree we pick up the next category, accrual accounting operations relying on non-professional family members to oversee their accounting process. We assume this group is already committed to real-time inventories, so the decision they face regards cost analysis. If their goal is a traditional "enterprise analysis" approach of splitting expenses between commodities then they will also choose Method B. However, if they desire a more structured, multi-layered cost accounting system for allocating and flowing costs through their various management segments they will select Method ABC. The decision for the final group, accrual accounting users relying on professional oversight, is whether they want their financial statements adjusted directly by real-time changes in raw material, work in process and finished goods inventories. Controllers who want to maintain a "high level" inventory valuation system not directly linked to production activities will chose Method A. Accounting professions who want to "drive" financial statements from real-time activities will chose Method ABC. Note that while there are just four accounting "destinations," six paths lead to those end points, representing a wide-ranging combination of starting points and priorities. In summary, you will chose Method C if your accounting process is strictly on the cash basis and you don't want to track inventories through accounting. You will select Method B if you want to add real-time inventories to your cash accounting system and/or incorporate enterprise analysis into your accrual system. Method A will be your choice if your accrual books are maintained by accounting professionals who prefer to maintain financial statements independently from day-to-day farm production activities. Operations that are already on some form of accrual accounting will move to Method ABC if ownership desires managerial accounting (as opposed to enterprise analysis) and/or the accounting professionals requires a tighter financial link to real-time changes in raw material, work in process and finished goods inventories. Even though our core business in agricultural accounting software, we acknowledge that producers can and do achieve Methods C and A with off-the-shelf general accounting software. Conversely it's very convoluted and cumbersome to attempt Methods B and especially ABC without specially-designed ag software. Next month we'll delve into these methods and compare their advantages and disadvantages.